Ivory poaching isn't the only threat to elephant populations across Africa. Bush meat hunting also claims many victims. Trapped by illegal snares intended for antelope and other small game, these indiscriminate devices capture anything from birds to young elephants, causing unspeakable suffering and, all too often, a painful and drawn out death. 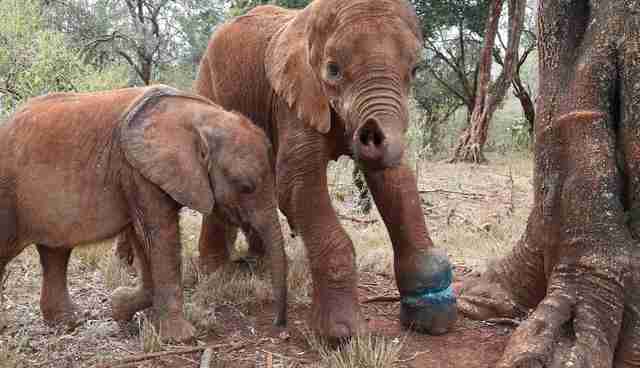 One lucky survivor is Mwashoti, a male elephant calf who first came to our attention in February 2015 when he was spotted with a severe injury to one of his front legs, the result of a tight snare which had cut deep to the bone, very nearly severing the foot from the leg. As our intention is to keep wild families together wherever possible, we were keen to give him a chance to heal in a wild situation. He was treated by our DSWT / Kenya Wildlife Service (KWS) Tsavo Mobile Veterinary Unit who cut loose the strangulating cable, thoroughly cleansed the wound and administered long-acting antibiotics before reuniting him with his herd. Given the extent of his injuries and concerned for his vulnerability, we monitored his progress with one of our DSWT / KWS Anti-Poaching Teams and scheduled a second treatment but, over the weeks, it became clear that his condition was deteriorating. No longer able to keep pace with the rest of the herd, his mother was forced to drop back, unable to travel any distance for food, leaving the pair in a desperate state. For the sake of both mother and calf, it was decided that a rescue operation must be mobilised, bringing the calf into the care of our Nairobi Nursery and allowing his mother to re-join the safety of her herd. 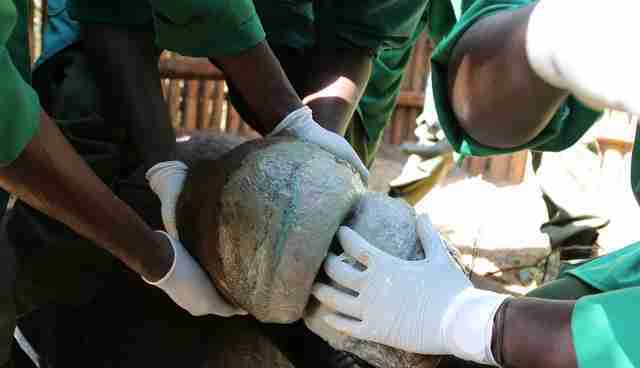 Named Mwashoti, this brave little bull remained in his stockade for the first three weeks to rest his foot, all the while receiving intensive care with his wound being cleansed, packed with healing green clay and bandaged. But just as crucial to the healing process was the comfort and company of those like him, the little herd of orphan elephants also in our care, and Mwashoti's spirit was lifted enormously when he was able to join his new family for his first walk with them into the bush. 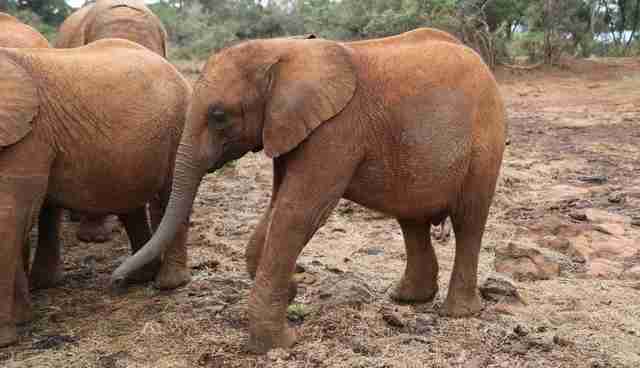 Mwashoti's calm nature fast made him a favourite uncle amongst the smallest members of the Nursery herd. 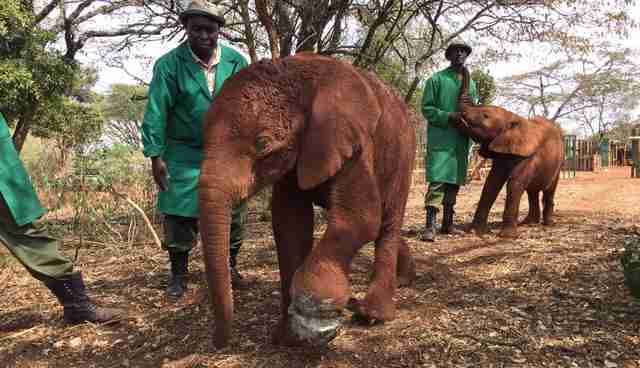 With his little friends seemingly mindful of the need to be gentle around him in his compromised state, they even tenderly touched his wound with their trunks and blew soft red earth onto it in an effort to aid his healing. Due to the love and care he has enjoyed, both from his orphan family and our dedicated team of Keepers, Mwashoti has gone from strength to strength, surpassing our wildest expectations! 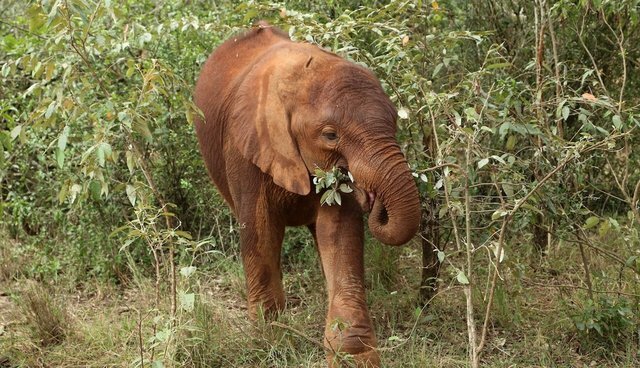 Proving the miraculous power of green clay and his own strong will to recover, Mwashoti's foot has now completely recovered, and he is all but skipping about the bush, fully able to keep up with the other youngsters and keen to take on 'pushing' games with the boys. Mwashoti's recovery is remarkable and we are confident that he will one day return to live a full life in the wild, but his injury serves as a graphic reminder of the plight faced by wildlife across Africa. 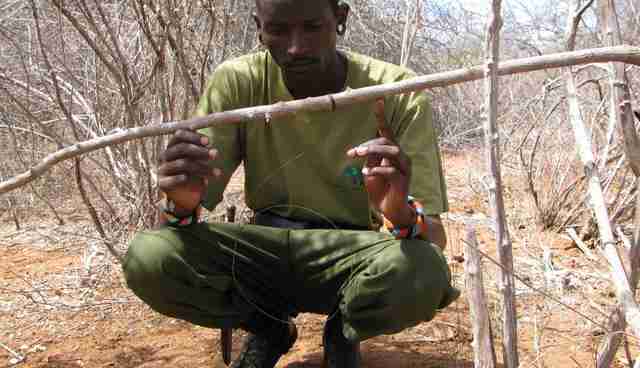 A single snare can be re-laid many times over, threatening all manner of animals, including young elephants. Our DSWT / KWS Anti-Poaching Teams are working day in, day out throughout the greater Tsavo Conservation Area to combat this and this year alone have removed and confiscated more than XXXX snares, saving countless wild lives.